Jonathan Beattie receives a District Commander's Certificate of Recognition, with l to r, Stuart MacDonnell, John McGill, David McIlveen MLA, and Dr John Topping. 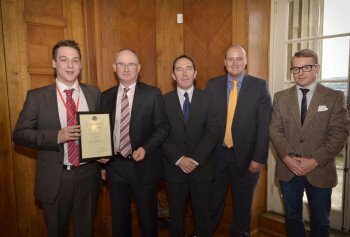 David McIlveen MLA hosted seven final year undergraduate Criminology & Criminal Justice students from the University of Ulster at Parliament Buildings today, as they were presented with a certificate of achievement from the Policing Board’s Stuart MacDonnell as part of a dynamic collaboration between the University of Ulster and the PSNI. The collaboration involved the students, as part of a final year project, conducting primary research within the Ballymena, Coleraine, Ballymoney, Moyle and Larne Council areas, or “H” District in policing terms. The research focused on PSNI’s Policing with the Community Strategy within “H” District, looking at its implementation amongst specific sections of the community. The students were assisted by a senior PSNI officer who acted as a ‘mentor’ and whose role it was to act as an official liaison between the police and the student. In addition, all the students were supervised by Dr. John Topping, a lecturer in criminology and policing expert from the University’s School of Criminology, Politics and Social Policy. - Service Delivery within the PSNI. “The event today at Stormont is a recognition of the fantastic and cutting-edge police research undertaken by these final year BSc. (Hons.) Criminology and Criminal Justice degree students. The whole programme has not only been a unique collaboration between ourselves and PSNI, but has also opened up a range of new research avenues with PSNI in terms of using academic expertise to help generate evidence-based policy and practice as part of the delivery of policing in the country. "It has been a real pleasure to both supervise the students and work with PSNI on the programme who also deserve significant credit for their work as part of the programme. The have taken the lead on a ground breaking research collaboration and we hope other criminal justice agencies take their lead. I also look forward to the roll out of the programme into the future". “This innovative research project delivered tangible benefits for all those involved and the findings will be used to enhance police service delivery to the community. "As a DUP member of the Northern Ireland Policing Board, I am extremely committed to policing within the community. It is a credit to these young people that they have produced such valuable research in this area and it is only right that they receive the recognition they deserve. “H-District encompasses my own constituency of North Antrim and the research into such areas as Agri Crime, Anti-Social Behaviour and engagement with Ethnic Minority Communities are some of the most topical issues at present. Congratulations again to all those involved and I wish them well in their future careers."